I-M Magnetic Waist Belt EB-505 is a lumbar support belt that helps reduce lumbar pain and strain and improve blood circulation. It provides support and light compression to the back. 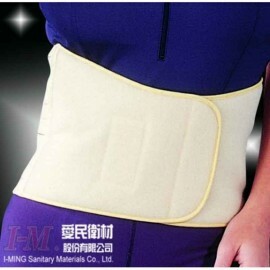 The I-M Magnetic Waist Belt EB-505 is manufactured using high quality fabric and 24 pieces of circular magnets embedded inside that help increase the metabolism of body and reduce pain using magnetic field. It is soft, easy to use and comfortable to wear.